MOORESVILLE, NC (December 18, 2018) – World of Outlaws Sprint Car Series team Kasey Kahne Racing (KKR), announced today Wicked Energy Gum, an innovative consumer energy product developed by Wicked Cushion, has been signed as a new sponsor for KKR’s No. 9 team that will be driven by Kasey Kahne in 2019. Wicked Energy Gum is a convenient, great tasting, alternative to energy drinks. You can enjoy up to a 5x faster boost in energy, alertness and focus without having to fill up on liquids. Wicked Energy Gum has compressed the best energy boosting ingredients into each piece of gum so that you can get a fast-acting boost of energy whenever you need it most. Retiring from full-time NASCAR competition after a successful 15-year career in stock cars, Kahne is returning to his roots and is scheduled to compete in more than 50 sprint car events on both the World of Outlaws and All-Star Circuit of Champions tours in 2019. 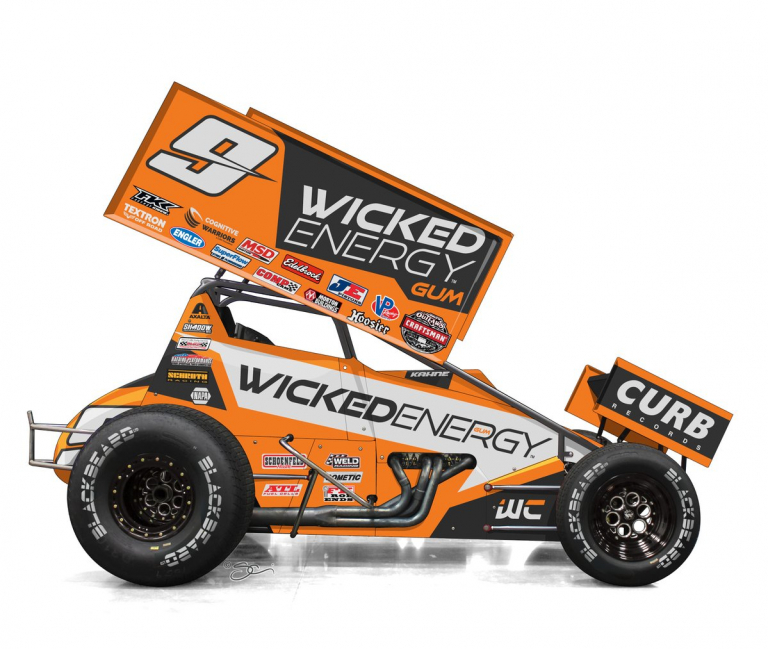 Wicked Energy Gum will kick off the 2019 season on Kahne’s No. 9 machine, and will also have placement on Brad Sweet’s No. 49 NAPA AUTO PARTS car beginning February 6-10 at the Dirt Car Nationals at Volusia County Speedway in Barberville, Fla.
“We were fortunate enough to start a relationship with Wicked Cushion during the Knoxville Nationals last year and when they decided to launch their new product, Wicked Energy Gum, we were glad they chose KKR to help get their product off the ground,” said Kasey Kahne, owner of Kasey Kahne Racing. “This is the most excited I have been in a long time to get back to racing. I feel great and I’ve been working out a lot preparing for the upcoming season. Returning to sprint cars on a more regular basis is something that I have been looking forward to for years,” Kahne concluded. The World of Outlaws Sprint Car Series is the country’s premier dirt track series with 92 races at 53 different racetracks, in 25 states, over a nine-month season. KKR has won over 170 WoO feature events, including a championship in 2013. New York City based Wicked Cushion is a cross-aspect marketing platform and whose goal is to promote all forms of dirt track racing while helping to support the drivers, leagues, and facilities that work so hard to entertain race fans. The Wicked Cushion platform works to introduce innovative products, brands and companies to dirt track racing and the overlooked value of dirt track Motorsports and eSports. Wicked Energy Gum is an exclusive brand of Wicked Cushion, LLC and is designed to give you a fast-acting boost of energy whenever you need it most! You only need to chew once piece of Wicked Energy Gum for 5 to 15 minutes to get a great boost of energy and focus. Wicked Energy Gum is sold in packets of 10 pieces per pack and on a “per piece” basis can be better than half the cost of most liquid alternatives. The Mooresville, N.C.-based company was formed in 2005 and employs more than 12 people dedicated to sprint car racing. KKR fields entries in the World of Outlaws Sprint Car Series for Kasey Kahne and Brad Sweet. In 2013, KKR’s No. 9 Great Clips/ASE Sprint Car team driven by Daryn Pittman won the World of Outlaws Sprint Car Series championship making Kasey Kahne a first-time champion team owner. This was the first championship for Kahne and his KKR organization. The organization now has over 145 feature wins in the World of Outlaws Sprint Car series. Kasey Kahne abruptly ends his NASCAR career; Off to the dirt tracks!